Herb-Scalloped Potatoes - Eat. Drink. Love. It’s Friday AND it’s Halloween weekend! It is bittersweet for me. On the one hand, it means that it is time to carve pumpkins, hand out candy, eat candy, and watch the Ghost Hunters Live investigation. And on the other hand, it means that after Monday, I have to take down the Halloween decorations. Where did October go?!! Today I bring you another great recipe from my bridal shower book! 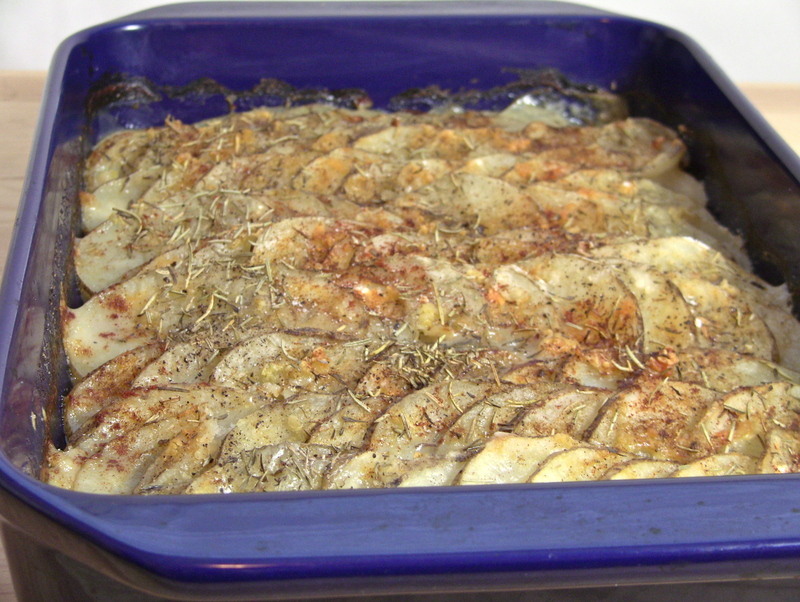 This recipe for herb-scalloped potatoes comes to you from my B.F.F., Crystal! Crystal and I have been friends since we were freshmen in high school. She was my maid-of-honor and I am so excited because she is getting married in January and I get to be her matron-of-honor! I don’t eat potatoes very often because of the carbs, but these potatoes sounded too good to pass up! They are a little time consuming to put together (it took me almost 30 minutes to prepare), so if you are going to make them, make sure to plan ahead! These scalloped potatoes are really flavorful with all of the herbs and are much healthier than their cheesy cousin! 1. Preheat oven to 400 degrees. Lightly grease (or spray with non-stick spray) a 9 x 13-inch baking dish. Layer the potatoes in the pan, allowing them to slightly overlap. Lay them across the short way first overlapping them a little less than half of each potato slice. In each subsequent row, overlap the potatoes by about one-quarter of each potato slice. 2. Pour about 3/4 of a cup of the broth over the potatoes, reserving the rest for later. Pour the milk and drizzle the olive oil over the potatoes, making sure to coat each one (I think I needed 1 1/2 tbs. of the oil). 3. Scatter the minced garlic over everything and then sprinkle 2 tbs. of the flour over all of the potatoes. Drizzle as much of the remaining broth as you need in order to moisten all of the flour (avoid washing away the flour when you pour the broth). Sprinkle the last tbs. of flour, the herbs, paprika, salt and pepper. Cover loosely with foil and bake for 35 minutes. Uncover and bake for an additional 15 minutes. – To make these potatoes vegan-friendly, use vegetable broth and unsweetened soy milk. These are stunning! I love scalloped potatoes, but the overly cheese-y ones just don’t do it. This is fantastic! Love herbed potatoes and yours sound perfect! I definitely think the extra time was worth it. Those potatoes look wonderful. This looks delicious. I never make scalloped potatoes because I don’t have a mandoline and I am not the best with a knife. To me this is a very dangerous dish. mmm. I can almost smell them from here! So pretty! This looks like it would be a fantastic Thanksgiving dish!! Well done, and BUZZ! I love scalloped potatoes and these sound delicious…as always! I love scalloped potatoes, but I don’t make them often because I like to use heavy cream and it’s just too fattening to eat regularly. I really love your lightened up version, it doesn’t have tons of cream, but it still looks really tasty! And the photos are really great too! These look so pretty! And I bet they taste amazing. I love potatoes these look yummy! I have to carve pumpkins this weekend to where did the month go…. I love scalloped potatoes, these look fantastic and much healthier then the traditional cheesy recipes!!! I have a mandolin, so it makes short work of slicing them potatoes. I look at the end of Oct and Halloween not as a bad thing, it puts me closer to decorating for Christmas, my FAVORITE holiday! The way you laid these out in the pan is just beautiful–buzzed! My dad and I are big potato fan (crazy fan) and we’d eat this as main dish! lol. Look so good!! I’ve never had potato dish like this one. Lots of nice herb aromas and oh heavenly…. So beautifully styled…I love the way the potatoes look like gorgeous fish scales! 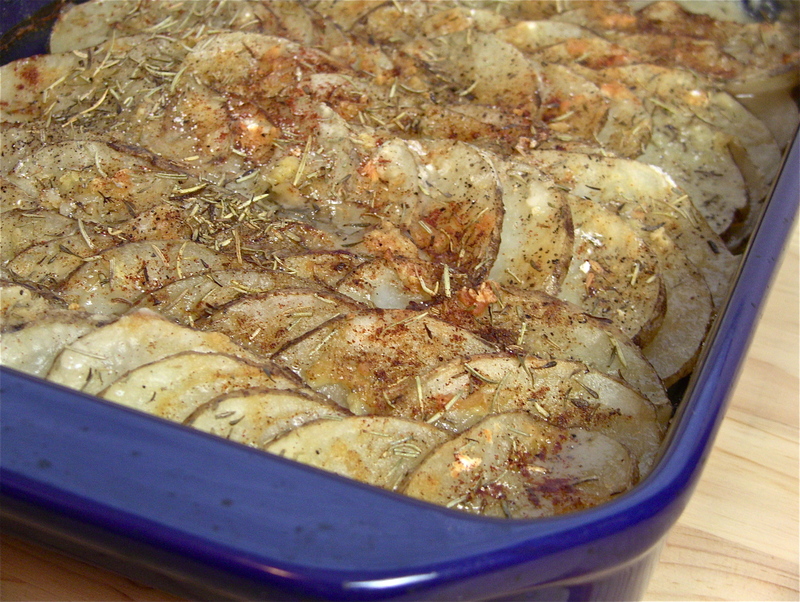 We love potato dishes…and this herbed version of scalloped potatoes is fantastic! Sounds like one heck of a perfect side dish! Oooh, I just love baked potatoes. These look so yummy! I’m with Ann – I love that these aren’t drowning in cheese! Love that these are heavy on the spices but not on the fat and oil! They look so tempting-nicely browned and layered. Thanks for sharing this lovely side dish-yum! These look GREAT! I’m not normally a big fan of scalloped potatoes, but I think this recipe might change that. 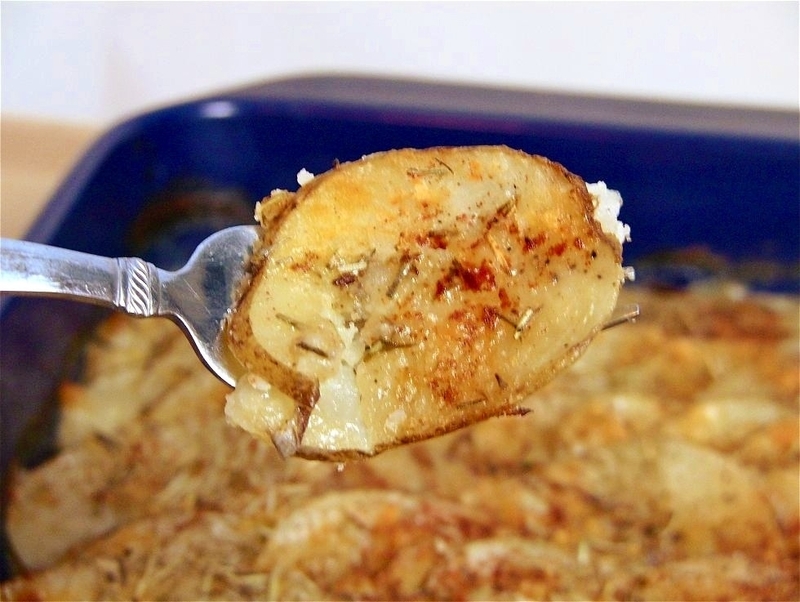 Love scalloped potatoes…this recipe looks delicious. Guess what? I’ve got 5 pounds of potatoes in the fridge…I think I know what I’ll be using them for!! Stephanie…these potatoes look awesome! So crusty and good. You are right…who would even miss the cheese with these? I’m sad to see October go, too. But these potatoes will help make me feel better! I’ve actually never been a huge fan of scalloped potatoes (with all that cheese and cream, etc it tends to get mushy) but I think I could really get behind this dish. Love that you brought out so many wonderful flavors with the herbs instead of trying to just drown it in a cheese sauce. I can even smell this dish. What a great idea to cook potatos. Definately worth trying it! Thanks for sharing. Stephanie, I love scalloped potatoes but almost never have them anymore…. I am delighted to have this recipe! They looks so delicious with all the gorgeous herbs … what a fabulous dish. I like this much skinnier version of scalloped potatoes than my mother used to make. Hers were loaded with heavy cream and cheese. These look light and delicious. I remember that my husband used to make something similar, but the fattier version with lots of cheese ;). I think I would feel much more guilt-free if I eat your version :)! Yeah…I’ll take the whole tray of these babies! And i’m upset to see October go too. It really did fly by! It’s going to be Christmas in no time! These look so good! I love the herbs on these, so much more interesting than the scalloped potatoes I had as a child! Oh wow! These potatoes sound delicious. I am not good at making scalloped potatoes yet. I’ll have to give them another shot. This dish looks wonderful! Love all the fresh herbs you used, they look so pretty! I love potatoes and I can’t be bothered about the carbs in them :D But wow this recipe sounds so good. The herbs added to it makes it sound like some gourmet dish. Love to try making this at home.